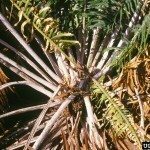 I have a 10 year old Sago Palm which has sprouted new growth. The new leaves are 5 feet long as opposed to all the other leaves that are 2 feet. Can this new growth be trimmed back to match the existing lengths and, if so, what would be the proper procedure to do this? I can email a picture if necessary. First of all, I think you're sago looks absolutely gorgeous. As those new leaves get older they will darken. You could cut them back to be more the length of the old leaves; just cut across the midrib with a pair of scissors. It's your plant, and your choice, but if it were mine, I'd be thrilled with those beautiful leaves.